By spreading diseases such as Zika, dengue and malaria, mosquitoes kill more than one million people annually and make countless others sick or debilitated. Vaccines and drug therapies to combat mosquito-borne illnesses are under development, but there is one genetic scientist who is pioneering a different approach: reducing the mosquito population with baker’s yeast. Molly Duman Scheel, a professor at Indiana University, has been awarded grants to identify an environmentally safe larvicide that kills mosquitoes before they can transmit diseases to humans. Scheel grew up in South Bend, Ind., where her father, an insect physiologist at Notre Dame, instilled in her a love of science and the natural world. Her high school biology teacher sparked her interest in genetics and developmental biology and invited her to participate in a high school research program. Molly was instantly hooked and developed a passion for research. At Notre Dame, Molly pursued research in insect developmental genetics and then continued her studies at the University of Chicago. New varieties of larvicides are needed because of increasing resistance to current products and the rising concern about unintended negative effects of pesticides. Scheel and her team have developed a larvicide that kills nearly 100 percent of Aedes aegypti mosquitoes in a laboratory environment. Known as yeast interfering RNA, the larvicide targets early mosquito nervous system development, preventing the insects from taking flight and transmitting disease. Not only is the larvicide safer and more effective than solutions commonly used in the field, but it can be reproduced through the cultivation of yeast, which is widely available and inexpensive to culture. A grant from USAID’s Combating Zika and Future Threats Grand Challenge in 2016 is enabling Scheel and her team to move the larvicide testing from the lab to the field. 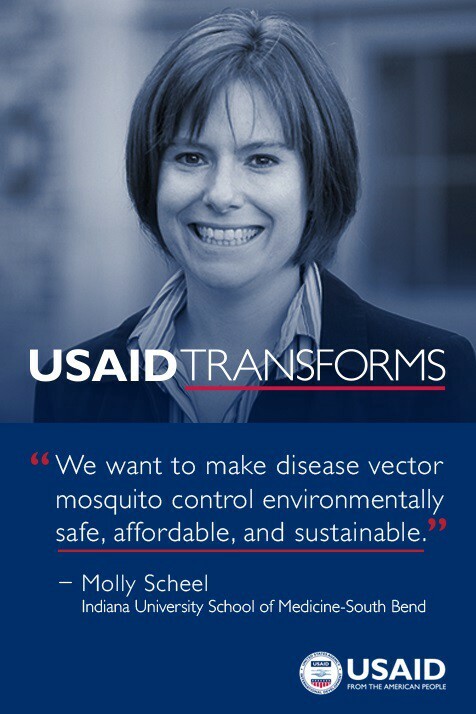 She was one of 26 awardees who received USAID investment to accelerate innovative approaches to fight the Zika outbreak and strengthen the world’s ability to prevent, detect and respond to future infectious disease outbreaks. While the development of interfering RNA technology happening in Scheel’s lab is still at the proof of concept stage, she and her team are optimistic about the future of this technology. The Aedes aegypti mosquito can be found on all continents, except Antarctica, with communities near the equator most affected. Molly Duman Scheel is an associate professor of medical and molecular genetics at the Indiana University School of Medicine-South Bend. She earned a bachelor’s degree at the University of Notre Dame and a doctoral degree at the University of Chicago.